Most of the recently identified autoimmunity loci are shared among multiple autoimmune diseases. The pattern of genetic association with autoimmune phenotypes varies, suggesting that certain subgroups of autoimmune diseases are likely to share etiological similarities and underlying mechanisms of disease. In this review, we summarize the major findings from recent studies that have sought to refine genotype-phenotype associations in autoimmune disease by identifying both shared and distinct autoimmunity loci. More specifically, we focus on information from recent genome-wide association studies of rheumatoid arthritis, ankylosing spondylitis, celiac disease, multiple sclerosis, systemic lupus erythematosus, type 1 diabetes and inflammatory bowel disease. Additional work in this area is warranted given both the opportunity it provides to elucidate pathogenic mechanisms in autoimmunity and its potential to inform the development of improved diagnostic and therapeutic tools for this group on complex human disorders. Autoimmune disorders (AIDs), which as a group affect approximately 8.5% of individuals worldwide , are responsible for a substantial amount of disability and morbidity. Some AIDs are organ specific (for example, type 1 diabetes (T1D) targets the pancreas, autoimmune thyroid disease (AITD) attacks the thyroid gland), whereas others can affect multiple organs and/or be associated with systemic manifestations. Systemic lupus erythematosus (SLE) is the prototypic systemic AID that can affect multiple organs and can also be associated with significant systemic manifestations, morbidity and early mortality . Most AIDs, including rheumatoid arthritis (RA), ankylosing spondylitis (AS), inflammatory bowel disease (IBD) and multiple sclerosis (MS) have a predilection for specific organs (for example, the synovial joints in RA and the gastrointestinal tract in IBD) but are also associated with manifestations outside the primary target organ. Reasons for the diverse manifestations exhibited by different AIDs remain unclear, but recent progress in elucidating genetic susceptibility loci for this group of disorders promises to shed light on this important issue. Although AIDs encompass a broad range of phenotypic manifestations and severity, several features suggest that they share common etiologic factors. For example, most AIDs are characterized by female predominance, and many are associated with the production of autoantibodies (for example, anti-citrullinated-peptide antibodies are observed among 70 to 80% of RA patients). These shared disease features, in conjunction with epidemiologic evidence that demonstrates the clustering of multiple AIDs within individuals and families, strongly implicate shared etiologic factors, including shared genetic loci. Familial clustering of autoimmune disorders has been long recognized and supports a role for shared genetic predisposition. For example, family studies have documented the clustering of certain autoimmune diseases among the relatives of individuals who have RA, MS, SLE, T1D and other diseases [3–9]. One of the earliest autoimmune disease clusters to be described involved RA, T1D and AITD, and this cluster was recently supported by a systematic review of studies describing clustering of RA, T1D, AITD and MS . Interestingly, that systematic review found evidence of inverse clustering of RA and MS, suggesting that MS and RA might be less closely related than some other AIDs . This conclusion was reinforced by a recent study comparing the genetic variation profiles of six AIDs . That study, by Sirota et al. , was based on an analysis of a large number of genetic variants examined in recent genome-wide association studies (GWAS). It found that RA and AS appeared to represent one AID cluster that is distinct from another represented by MS and AITD, with T1D showing similarity to both groups and Crohn's disease to neither. Early candidate gene studies, particularly those focusing on genes within the human leukocyte antigen (HLA) region , also supported the notion of shared 'autoimmunity' loci. Strong support for genetic loci that are shared across autoimmune disorders and located outside the HLA region has been demonstrated for several loci encoding proteins that have immune-mediating functions, including cytotoxic T-lymphocyte antigen 4 (CTLA4; a member of the immunoglobulin superfamily that is expressed on the surface of helper T cells and transmits an inhibitory signal to T cells), protein tyrosine phosphatase non-receptor type 22 (PTPN22; which is expressed primarily in lymphoid tissue and plays a role in the regulation of T-cell receptor signaling pathways), and tumor necrosis factor (TNF) alpha-induced protein 3 (TNFAIP3; which inhibits NF-kappa B activation as well as TNF-mediated apoptosis) [12–14]. Many of the recently identified AID loci involve pathways related to B-cell or T-cell activation and differentiation, innate immunity, and regulation of cytokine signaling [15, 16]. Certain loci, however, appear to be associated with specific autoimmune diseases. For example, variants in NOD2 (nucleotide-binding oligomerization domain containing 2) and ATG16L1 (ATG16 autophagy-related-16-like 1) have been associated with defective autophagy in dendritic cells from Crohn's disease patients . A theme emerging from recent genetic studies of AIDs relates to the surprising degree of overlap between genetic loci for this diverse group of disorders, given the phenotypic diversity. 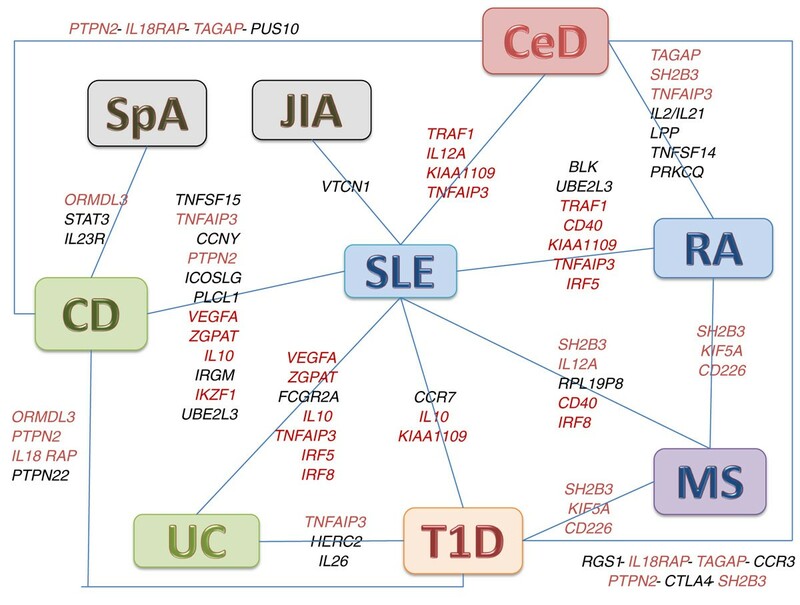 Several recent reviews have summarized emerging work that identifies both genetic loci that are shared across the spectrum of autoimmune disease and the biologic pathways whose involvement is implicated by these shared loci [15, 16, 18, 19]. For example, Zhernakova et al. completed a detailed review of 16 genome-wide association (GWA) or non-synonymous SNP scans for 11 immune-related disorders that were published in 2007 or 2008. Their analysis underscores the extensive sharing of genetic risk loci across this spectrum of disorders, and the fact that most of these loci can be mapped to a few shared biologic pathways, including those related to innate immunity, immune signaling, T-cell differentiation, cytokines and chemokines. The analysis by Zhernakova et al. also suggests that the degree to which each of these disorders is characterized by shared (rather than unique) susceptibility loci varies substantially, from all loci shared (for RA) to 50% or more shared for celiac disease, psoriasis, MS, SLE, T1D, AS and AITD . The two types of IBD examined, Crohn's disease and ulcerative colitis (UC), shared substantial numbers of loci between them but relatively few with the other AIDs studied. The extent to which the T-cell differentiation, immune cell signaling, innate immunity and TNF signaling, or other pathways are implicated for each of these disorders varies, but overall the analysis by Zhernakova et al. suggests that most of these pathways contribute (to a variable degree) to most of these disorders. In this review we focus on recent studies that have sought to refine genotype-phenotype associations by comparing susceptibility loci between specific AIDs. We concentrate on RA, AS, celiac disease, MS, SLE, T1D and IBD. Table 1 summarizes these AIDs in terms of their prevalence in the population and major phenotypic features. In particular, we focus on comparative studies that use GWA results to distinguish genetic variants that are specific to individual AIDs from those that are shared among multiple AIDs. We also summarize the results of a recently published cross-phenotype meta-analysis that uses genetic association results to highlight four main AID clusters. A detailed understanding of these shared and distinct genetic loci provides insight into fundamental etiologic mechanisms in autoimmune disease. It has the potential to inform the choice of current therapies and the development of novel targeted therapies and other interventions that could improve our ability to manage these complex human disorders. GWA and other recent genetic studies of AIDs have been remarkably successful in terms of the number of genetic loci that have been identified. For example, more than 70 genetic loci have now been firmly established as susceptibility factors for Crohn's disease , and more than 30 loci that contribute to the risk of RA and/or SLE have been identified [21, 22]. Following the completion of many large GWAS of individual AIDs, a number of studies have sought to refine the specificity of loci that are associated with AIDs. More specifically, these recent studies have examined AID risk loci identified for one AID in case-control collections that have been developed for another AID to distinguish between those risk loci that are shared and those that are distinct for the AIDs being compared. In Table 2 the specific disease comparison studies that are discussed in this review are listed alongside both the major shared (and unique) loci that have been identified and the biologic pathways or mechanisms implicated by these analyses. Table 3 and Figure 1 further highlight the patterns of shared AID risk loci and their associated pathways revealed in these studies. In the next section, we summarize very recent work by Cotsapas et al. that addresses these relationships in an analytically powerful way. Specifically, they utilized GWA data generated for seven AIDs and performed a cross-phenotype meta-analysis (CPMA) to distinguish between genetic variants that are common to all of these seven AIDs from variants that are common to some but not all of these AIDs and variants that are specific for one AID. GM-CSF, granulocyte-macrophage colony stimulating factor; LPS, lipopolysaccharide; NK, natural killer; TCR, T-cell receptor. Overlap of associated loci among autoimmune diseases highlighted in this review. Loci depicted in red are those shared by more than two autoimmune diseases. Loci depicted in black are those shared only by two autoimmune diseases. CD, Crohn's disease; CeD, celiac disease; JIA, juvenile idiopathic arthritis; MS, multiple sclerosis; RA, rheumatoid arthritis; SLE, systemic lupus erythematosus; SpA, spondyloarthropathy; T1D, type 1 diabetes; UC, ulcerative colitis. Several recent studies have compared the pattern of genetic association between T1D and other AIDs, including celiac disease , RA  and IBD . On the basis of the association of both T1D and celiac disease with HLA class II loci, Smyth et al. evaluated both the association of eight non-HLA celiac disease risk loci with T1D and of 18 T1D loci with risk of celiac disease in very large samples of patients, controls and families. Their analysis revealed that seven loci were common to these two AIDs, including RGS1 on chromosome 1q31, IL18RAP on chromosome 2q12, TAGAP on chromosome 6q25, a 32-bp insertion-deletion variant on chromosome 3p21, PTPN2 on chromosome 18p11, CTLA4 on chromosome 2q33, and SH2B3 on chromosome 12q24. Further, the associated alleles for IL18RAP and TAGAP confer risk of celiac disease but protection against T1D. Non-shared loci include the T1D risk loci INS (chromosome 11p15), IL2RA (chromosome 10p15), and PTPN22 (chromosome 1p13) and the celiac disease risk loci IL12A (chromosome 3q25) and LPP (chromosome 3q28). Eyre et al. extended this work by investigating genetic overlap between T1D and celiac disease risk loci and RA. They studied eight celiac disease risk loci and six T1D risk loci in a large sample of RA patients and control individuals. Although they found significant evidence for association of the TAGAP locus (which is associated with both celiac disease and T1D but with opposing effects) with RA and modest evidence of association between the C1QTNF6 T1D risk locus and RA, overall their investigation revealed little evidence of association between celiac disease and T1D risk loci and RA, suggesting that RA might be more genetically distinct. Finally, Wang et al. studied GWA data from large collections of IBD patients (Crohn's disease and UC), T1D patients and control individuals of European ancestry to identify shared susceptibility loci. Although they identified a number of overlapping susceptibility loci among these diseases, their results were notable for the frequency with which risk alleles for one disease appear to provide protection against another. They interpret these data as indicating that many AID risk loci could be under balancing selection and that variants that have opposing effects on different AIDs might contribute to the maintenance of common susceptibility alleles in human populations. Although the two types of IBD, Crohn's disease and UC, differ in several important ways, such as the depth and location of inflammation in the gastrointestinal tract (Table 1), the clustering of these diseases within certain families and their overlapping risk loci support their etiologic relationship. Thus, these diseases have often been considered together in GWA and other genetic studies. In addition to the aforementioned investigation of IBD and T1D , other recent work has investigated genetic overlap between IBD and other AIDs, including AS, celiac disease, psoriasis, SLE, RA and MS [20, 27–29]. As mentioned previously, a large number of loci that contribute to risk of IBD have been identified through GWA and related studies; some of these loci are shared by Crohn's disease and UC, whereas others are specific to one of these forms of IBD. This work has recently been reviewed by Lees et al. and is briefly discussed here. Among the shared loci, components of the IL-23 pathway are of particular interest because of the development of therapies directed against IL12p40, the protein subunit shared by both IL-12 and IL-23. Other AIDs that are associated with variants of IL-23R (that is, psoriasis and AS) are therefore candidates for the assessment of treatments that target the IL-23 pathway. By contrast, loci that are specific for Crohn's disease highlight the role of bacterial component clearance by infected cells through autophagy, mechanisms that might not be involved to the same extent in other AIDs. The spectrum of loci shared by IBD and other AIDs is more limited, involving innate immunity (IRF5), T-cell activation (PTPN22, IL2, IL2RA and IL21) or the activation of the unfolded protein response (ORMDL3). Interestingly, some variants affect the risk of different associated AIDs in opposite directions. For example, the PTPN22 allele, which is associated with increased risk of RA and SLE, reduces the risk of IBD. Several recent studies have investigated genetic risk loci that are shared between RA or juvenile idiopathic arthritis (JIA) and other AIDs, including SLE, T1D, celiac disease, IBD and MS [25, 30–33]. Studies investigating genetic overlap between RA and SLE have revealed both shared and distinct risk loci. For example, Orozco et al. studied 11 SLE risk loci (TNFSF4, BANK1, TNIP1, PTTG1, UHRF1BP1, ATG5, JAZF1, BLK, KIAA1542, ITGAM and UBE2L3) for evidence of association with RA. They found that RA cases were enriched, overall, for SLE genetic risk alleles. Variants within the BLK and UBE2L3 loci were most strongly associated with RA. Similarly, Suarez-Gestal et al. studied nine variants at the following SLE risk loci for evidence of association with RA among cases and controls from Spain: ITGAM, C8orf13-BLK, TYK2, 1q25.1, PXK, KIAA1542, MECP2, BANK1, and LY9. Previously established shared risk loci, including HLA, PTPN22, STAT4 and 6q23, were not studied. None of the nine SLE risk variants studied was significantly associated with RA, suggesting that the genetic contribution to these two AIDs is relatively distinct, although it is also possible that this study was not powered sufficiently to identify shared risk loci. Coenen et al. investigated the extent of genetic overlap between RA and celiac disease. Specifically, they evaluated 11 RA and 11 celiac disease risk loci among Dutch RA patients, celiac disease patients and control individuals. Their analyses revealed six risk loci that were shared by RA and celiac disease, which included the TNFAIP3, IL2/IL21, SH2B3, LPP, MMEL1/TNFRSF14 and PFKFB3/PRKCQ loci. Overall, the shared loci supported the importance of both adaptive and innate immunity in susceptibility to these two disorders. Thompson et al. used GWAS to investigate more than 400 genetic variants that had been associated previously with one or more AIDs to determine whether they are also associated with the risk of JIA. Using a two-stage design (discovery and replication cohorts), they found strong evidence of association for seven distinct loci, including PTPN22, PTPN2, ADAD1-IL2-IL21, STAT4, C12orf30, COG6 and ANGPT1. These loci have been previously associated with RA, T1D, Crohn's disease and/or MS, supporting genetic overlap between JIA and a broad spectrum of AIDs. Given the phenotypic heterogeneity of JIA, which includes several distinct clinical and serologic subgroups, however, further work will be needed to clarify whether patterns of shared risk loci differ among specific JIA subsets. In addition to the studies mentioned above that have compared the overlap between SLE and RA risk loci [30, 31], recent work by Ramos et al. suggests only modest overlap between SLE and other AID risk loci. More specifically, these authors evaluated 446 genetic variants that had previously been associated with one or more of 17 AIDs to determine which loci were significantly associated with SLE susceptibility. A number of AID loci, including FCGR2A, IL10, IRGM, TNFAIP3, IKZF1, IRF5, BLK, IRF8, and UBE2L3, were associated with SLE and one or more other AIDs. However, many SLE loci, including ITGAM, TNFSF4, PTTG1, PHRF1, WDFγ4 and BANK1, were associated with other AIDs only weakly, if at all. Multiple sclerosis is characterized by very strong associations with HLA class II variants, but some of the other genes that are strongly associated with multiple AIDs, such as PTPN22, do not appear to contribute substantially to the risk of MS. Nonetheless, emerging evidence from GWAS supports overlap of MS-associated genes with genes that have been linked to a broad spectrum of AIDs . For example, work by Alcina et al. in which 12 genetic variants previously associated with other AIDs were studied in a large collection of Spanish MS cases and control individuals identified three shared susceptibility loci, including KIF5A, SH2B3 and CD226, that also influence risk of RA, T1D and SLE (SH2B3). More recently, a collaborative GWAS involving almost 10,000 MS cases recruited from 15 different countries has identified a large number of susceptibility loci, most of which map to regions containing immunologically relevant genes . Particularly over-represented are loci implicated in T-helper-cell differentiation. Further, just over one-third of the MS risk loci identified overlap with regions previously identified in GWAS of other AIDs. Most of these shared risk loci have been associated with celiac disease, T1D, RA and/or IBD . As mentioned previously, recent work by Sirota et al. highlights the fact that certain variants that are associated with increased risk for some AIDs appear to be protective for others. More specifically, Sirota et al. studied six AIDs (T1D, MS, AS, RA, Crohn's disease and AITD) and found that AS and RA formed one group, and MS and AITD formed another group (with T1D showing similarity to both groups and Crohn's disease to neither). Further, susceptibility variants that are associated with the first class of AIDs generally had a protective effect in relation to the second class of AIDs. As an example, TAP2, which is involved in the transport of antigens from the cytoplasm to the endoplasmic reticulum for association with MHC class I molecules, was found to be a susceptibility factor for AS, RA and T1D, but a protective factor for MS and AITD. Cotsapas et al. have recently completed a CPMA that significantly extends our understanding of shared and distinct AID loci. More specifically, they studied 107 SNPs associated in recent GWAS with one or more of the following AIDs: celiac disease, Crohn's disease, MS, psoriasis, RA, SLE and T1D. Their study indicates that almost half of these loci (47/107, 44%) are associated with multiple AIDs; many of these variants were not previously known to be shared across AIDs. Nine of these 47 variants had opposing effects in different AIDs. Cotsapas and colleagues also examined patterns of disease association for the 47 shared loci, and found that just one locus, a variant in an exon of SH2B3 (rs3185404) was significantly associated with all seven of the AIDs examined. The remaining 46 variants were associated with subsets of the seven AIDs. The authors extended their analysis of these variants to try to elucidate the molecular pathways underlying these subgroups of AID. Four clusters were revealed on the basis of the patterns of AID associations. The first cluster, represented by variants in IL23R, IL12B, PTGER4, JAK2, KIF21B, STAT3 and other genes, was most strongly associated with Crohn's disease, psoriasis and MS. A second cluster, represented by variants in STAT4, IRF5, TNFAIP3, RGS1, CCR1, IL18RAP, IL2-IL21 and UBE2L3, was most strongly associated with celiac disease, RA and SLE. A third cluster, represented by variants in ORMDL3, CLEC16A, IL2RA, PRKCQ, CYP27B1, IKZF1 and ETS1, was most strongly associated with T1D, MS and RA. A fourth cluster, represented by variants in SH2B3, PTPN2, PTPN22, PRKCQ, CTLA4, UBASH3A, IL10, IFIH1, IL2, BACH2, IL27, CD226 and other genes, was most strongly associated with T1D, RA, celiac disease, Crohn's disease and SLE. Further, an analysis of protein-protein interactions revealed that the proteins encoded by variants within groups were more likely to interact with each other (either directly or via intermediates) than with proteins encoded by variants in other groups, underscoring the biologic relevance of the AID relationships defined by this CPMA. The delineation of genes and pathways that relate more specifically to certain AIDs than to others provides valuable information that can be used to target autoimmune phenotypes with interventions that are relevant to those pathways. The highlighted biologic pathways then provide a focus for more fundamental research, aimed at elucidating the underlying disease mechanisms in autoimmunity, and they could inform the development of novel therapies. The success of anti-TNF targeted therapies for a diverse group of autoimmune disorders, including RA, IBD, psoriasis, AS and others , nicely illustrates the potential value of this information. Similarly, the aforementioned collaborative GWAS of MS  highlights loci that are related to MS therapies, including VCAM1 (natalizumab) and IL2RA (daclizumab). As recently summarized in a review by Rai and Wakeland , despite the dramatic increase both in the number of risk loci recently identified for human AIDs and in information about patterns of shared risk and biologic pathways, the current literature does not provide a complete mechanistic understanding of biologic pathways that explain the pattern of AID susceptibility in human populations. Additional work will be required to refine genotype-phenotype relationships in autoimmune disease more completely. This research should include larger case-control studies in diverse population groups and the application of new technologies, such as next-generating sequencing, to define all of the relevant genetic variation. Given the 'missing heritability' of human AIDs, and the fact that current GWAS have captured primarily common genetic SNP variants, it is likely that rare or structural variants explain much of the missing heritability, the identification of which will require new and emerging technologies. Finally, once the complete genetic architecture underlying human AIDs has been characterized, additional methods will be required to define the functional mechanisms that explain these genetic associations. Owing to the rapid pace of identification of AID-associated genes during the past 5 years, primarily as a result of GWAS, there is now a wealth of information available that allows for a more thorough delineation of the extent of genetic overlap across this broad group of disorders. Loci that are shared between various AIDs and involved in a wide range of immune pathways (for example, T-cell activation, B-cell activation, cytokine signaling) might help explain common pathogenic features and inform the development of novel therapies. Further, the lack of overlap for other loci and pathways (for example, IL23R and STAT3 in IBD or spondyloarthritis) also suggests distinct pathogenic mechanisms that could explain, at least in part, the phenotypic diversity across the spectrum of autoimmune disease. It is important to keep in mind, however, that current studies are likely insufficiently powered to characterize fully the genetic architecture of AIDs, including shared and distinct loci and biologic pathways. Thus, the ongoing generation and analysis of data emerging from GWA and other genetic studies is warranted in order to better define genotype-phenotype associations in human AIDs and to clarify which pathways and specific targets are most relevant to the diseases within this diverse group of human disorders.